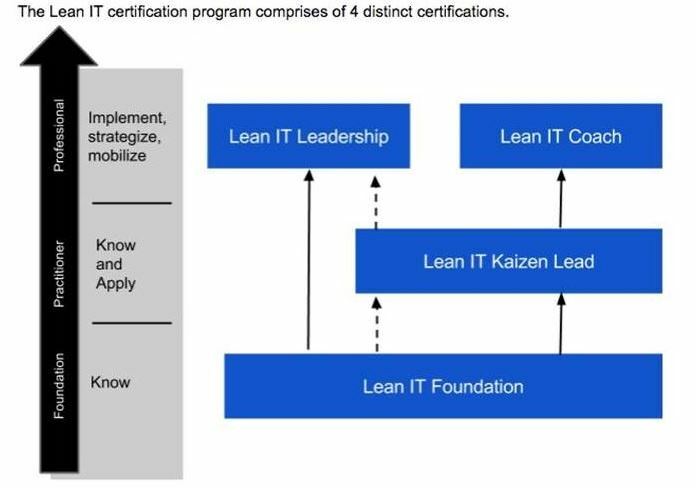 The Lean IT Foundation level course is the first in the new Lean IT certification program defined by the Lean IT Association. It is a mandatory requirement for all other levels within this certification scheme. After acquiring Foundation Level Certification, you can gain a deeper, more practical level of knowledge about Lean IT and Six Sigma by taking the other courses, also offered by The ITSM HUB. Based on the core principles of Lean, the two-day Foundation level certification course will help IT departments become more business-value oriented, removing waste, inflexibility and variability. The principles of Lean IT are applicable to all IT operations regardless of industry or sector. Any organisation effectively applying Lean IT will notice increased user and customer satisfaction, reductions of IT costs, increased productivity, and ability to manage demand more efficiently. Lean IT is built on the proven Lean and Six Sigma practices developed in manufacturing organisations around the world, and the new courses have been tailored for IT processes (including ITIL®, COBIT®, etc). Regardless of which framework or standard your IT organisation has chosen, the central focus of Lean IT is about learning how to assess a process to eliminate waste, where waste is defined as something that adds no value to a product, service, or output. This course is designed for EVERYONE! At The ITSM HUB we strongly believe that “Lean Thinking” needs to be a part of EVERY IT professional’s toolkit. Already, many roles from service desk analysts through to process owners, team leads and supervisors, department managers and also including CIOs, have taken this course and benefited greatly from a deeper understanding of how to assess business processes to identify and eliminate waste. You will attain 0.5 credits of the 6 complementary credits allowable towards the ITIL Expert certification.